Stephen Fry has confirmed he and Sir Ian McKellen will pay a copyright licence fee so a Southampton pub can carry on trading as The Hobbit. The pub was threatened with legal action by Hollywood film firm the Saul Zaentz Company (SZC) which accused it of copyright infringement. It later offered to resolve the dispute over the pub's name and decor by licensing it to use JRR Tolkien brands. Landlady Stella Roberts said she had been shocked by the actors' offer. She said: "I had a telephone call on Saturday evening, while we were trading, from Stephen Fry's business partner and manager. That's when he told me. "They've said as soon as they finish filming they would like to come down and visit the pub." However Ms Roberts said she was not celebrating just yet. She added: "Until everything is in black and white, on paper, we're going to be a bit reserved because it could be $100 this year and $20,000 next year. "They have said to us they will offer us a licence to trade, but we don't know whether it means trading as The Hobbit, whether we still have to get rid of all our artwork, cocktail names, everything. We just don't know what's entailed." Actor and presenter Fry, who is in New Zealand working on the forthcoming film of the Hobbit, posted on Twitter: "Ian McKellen and I v pleased that The Hobbit pub appears to be safe. "Between his FB and my tweet I hope we helped common sense prevail." His agent Hamilton Hodell confirmed that Fry and Sir Ian had agreed to pay the fee for the pub's copyright settlement with SZC. Both actors had criticised the film company's action. Sir Ian, who plays Gandalf in the Lord Of The Rings films, described the film company's actions as "unnecessary pettiness" and Fry said it was "self-defeating bullying". A Facebook campaign set up by the pub's users has more than 57,000 supporters. SZC owns the worldwide rights to several brands associated with author JRR Tolkien, including The Hobbit and The Lord of The Rings. Producer Paul Zaentz told the BBC trademark law dictated it had to act against infringements of its brands, but were open to licensing the pub to use them. He said: "When it's an established business, we like to get the company to acknowledge they are using our trademarks, stop selling infringing articles and then we will grant them a licence for a nominal fee - approximately $100 a year." The pub in Bevois Valley, which is popular with students, has traded with the name for more than 20 years. 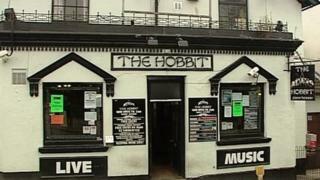 It features characters from Tolkien's stories on its signs, has "Frodo" and "Gandalf" cocktails on the menu and the face of Lord of the Rings film star Elijah Wood on its loyalty card. A letter from SZC had asked the pub to remove all references to the characters.